Showing items in category Rhodesia, sorted by newest listed first. RHODESIA - 1965 2/6d 'Independence' adhesive FORGERY sheetlet of nine. 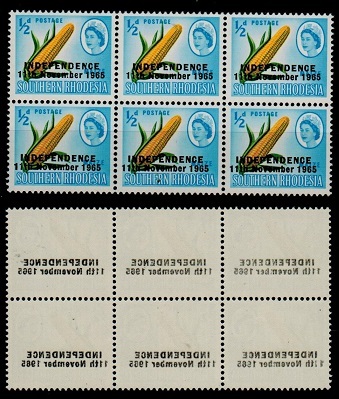 1965 2/6d multicoloured 'Independence' adhesive (SG 358) FORGERY in a complete mint pane of nine with RHODESIA LOYALISTS/ 22/6d imprint below. 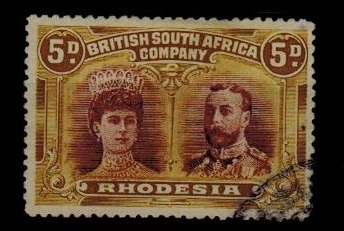 RHODESIA - 1896 imperforate proof of the vignette in brown (SG type 5) trimmed at bottom. 1896 IMPERFORATE PROOF of the central vignette (SG type 5 with dot to right of tail) printed in deep red-brown on gummed paper. The bottom of the proof has been trimmed off and the item has a light ironed out crease. Probably taken from printers waste. RHODESIA (Zimbabwe) - 1980 30c 'Inyangombi Falls' IMPERFORATE PLATE PROOF pair. 1980 30c 'Inyangombi Falls' IMPERFORATE PLATE PROOF pair of the Mardon printing. RHODESIA (Zimbabwe) - 1980 25c 'Goba Falls' IMPERFORATE PLATE PROOF pair. 1980 25c 'Goba Falls' IMPERFORATE PLATE PROOF pair of the Mardon printing. RHODESIA (Zimbabwe) - 1980 4c 'Garnet' ' IMPERFORATE PLATE PROOF pair. 1980 4c 'Garnet' ' IMPERFORATE PLATE PROOF pair of the Mardon printing. RHODESIA - 1965 ONE CENT black on 1d orange 'RAILWAY' stamp in a fine mint pane of 50. 1965 'ONE CENT' black on 1d orange RHODESIA RAILWAYS/SINGLE NEWSPAPER RAILAGE stamp in a fine unmounted mint marginal pane of 50 as issued. Originally issued in sheets of 48 but changed to this new format when decimal currency was introduced. Shows the variety DOT TO RIGHT OF R IN RAILWAY on Row 1/3 and 2/5. Used at Mafeking. 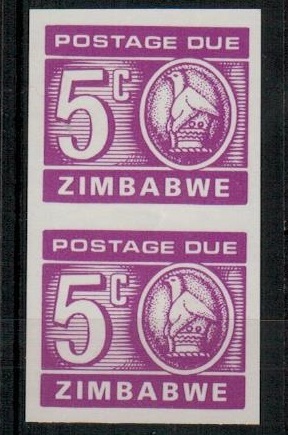 RHODESIA (Zimbabwe) - 1980 5c 'Postage Due' in a IMPERFORATE pair. SG D25a. 1980 5c bright reddish violet IMPERFORATE 'Postage Due' vertical pair on gummed paper. SG D25a. RHODESIA - 1910 1/- 'Double Head' mint (gum fault) with GASH IN EAR. SG 151. 1910-13 1/- grey black and deep blue green 'Double Head' adhesive in fine mint condition (small gum loss at top right edge) showing the GASH IN EAR variety from Row 1/2. SG 151. RHODESIA - 1910 5d 'double head' used with GASH IN EAR variety. SG 141a. 1910-13 5d purple brown and olive yellow 'double head' adhesive used with GASH IN EAR variety from Row 1/2. SG 141a. RHODESIA - 1915 1/2d rate postcard use to Johannesburg used at SINOIA. 1915 (JUL.24.) use of picture postcard addressed to Transvaal depicting 'Public Gardens-Salisbury' bearing 1/2d 'admiral' adhesive tied by fine SINOIA/S.RHODESIA cds. 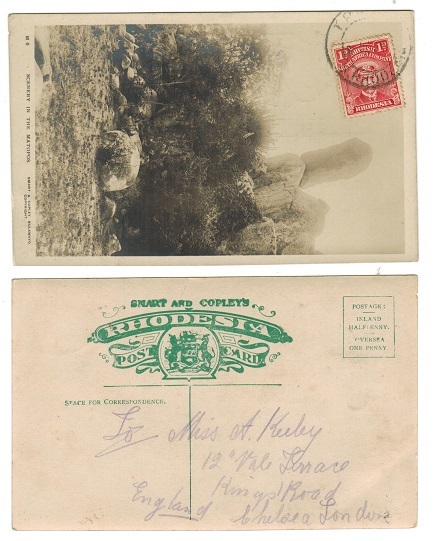 RHODESIA - 1910 1/2d rate 'Double Head' use postcard to Cape. An early use. 1910 (DEC.17.) 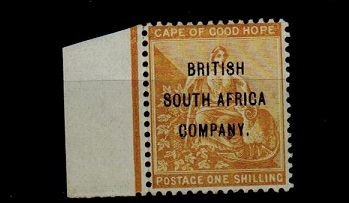 use of postcard addressed to Cape Of Good Hope bearing 1/2d 'double head' tied by GATOOMA/S.RHODESIA cds with HIGHLANDS arrival cds at left. A scarce early use of this stamp in 1910. 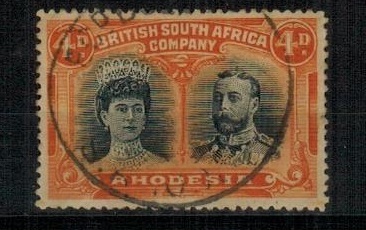 RHODESIA - 1910 4d black and orange 'double head' cancelled by 'REGd BULAWAYO' cds. 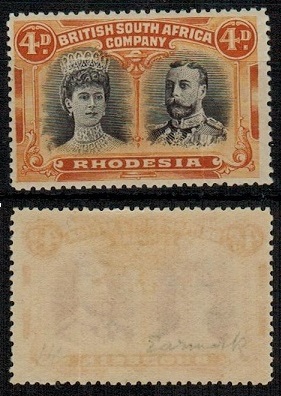 1910-13 4d black and orange 'double head' shade variant from position 28 showing MARKS OVER KINGS HEAD cancelled by REGd BULAWAYO cds. The strike appears to be single ringed but has been struck in a way as to only show the outer ring and is without dating. Proud type R4. 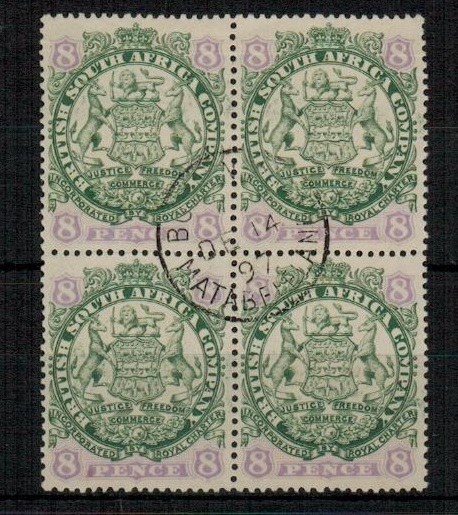 RHODESIA - 1896 8d green and mauve block of four used at BULAWAYO/MATABELAND. SG 34. 1896 8d green and mauve (dot behind tail) adhesive in a fine block of four cancelled by central s/r BULAWAYO/MATABELAND cds dated DE.4.97. Proud type D3 - Clear B. SG 34. RHODESIA - 1910-13 8d dull purple and purple fine mint with GAS IN EAR variety. SG 147. 1910-13 8d dull purple and purple 'double head' adhesive in fine mint condition (hinge remains) showing the GASH IN EAR variety from row 1/2. SG 147. RHODESIA - 1910-13 6d red-brown and mauve fine mint with GASH IN EAR variety. SG 144. 1910-13 6d red brown and mauve 'double head' adhesive in fine mint condition showing the variety GASH IN EAR from Row 1/2. SG 144. RHODESIA - 1910-13 5d purple-brown and olive green fine mint with GASH IN EWAR variety. SG 141. 1910-13 5d purple-brown and olive green 'double head' adhesive in fine mint condition showing the GASH IN EAR variety from Row 1/2. SG 141. RHODESIA - 1910-13 4d brown-purple and orange fine mint with GASH IN EAR variety. SG 139. 1910 4d brown-purple and orange in very fine mint condition showing the GASH IN EAR variety from Row 1/2 although with small repaired tear right of the 'A' of Rhodesia at bottom edge. SG 139. RHODESIA - 1910-13 4d greenish black and orange fine mint with GASH IN EAR variety. SG 138. 1910-13 4d greenish black and orange 'double head' in fine mint condition showing the greenish hue diffused to reverse and with major variety GASH IN EAR from Row 1/2. SG 138. 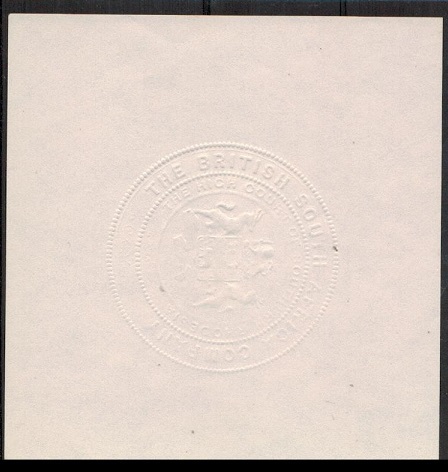 RHODESIA - 1889 (circa) 'THE BRITISH SOUTH AFRICA COMPANY' embossed seal on white paper. 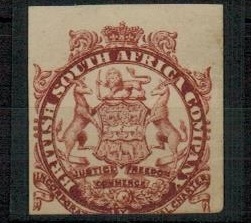 1889 (circa) 'THE BRITISH SOUTH AFRICA COMPANY' embossed seal applied to (95x90mm) white paper. Unusual item. 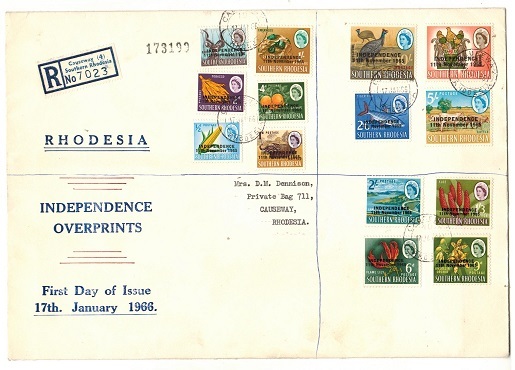 RHODESIA - 1966 'Independence' definitive first day cover used at CAUSEWAY. 1966 official registered first day cover of the Southern Rhodesia pictorial definitive series overprinted 'Independence/11th November 1965' (SG 359-372) and cancelled by CAUSEWAY/10/RHODESIA cds's dated 17.JAN.66. This FDC did not contain the Churchill overprint. RHODESIA - 1966 definitive first day cover used at CAUSEWAY. 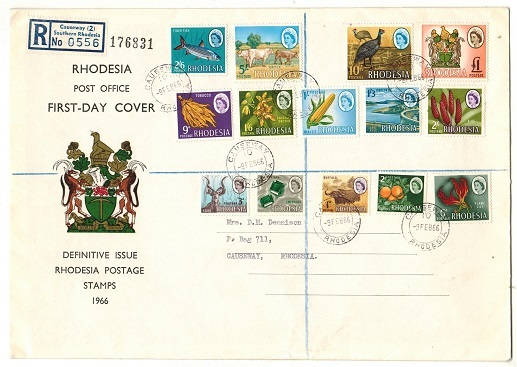 1966 official illustrated registered first day cover of the pictorial definitive series (SG 374-87) complete and tied by d/r CAUSEWAY 10/RHODESIA cds's dated 9.FE.66. 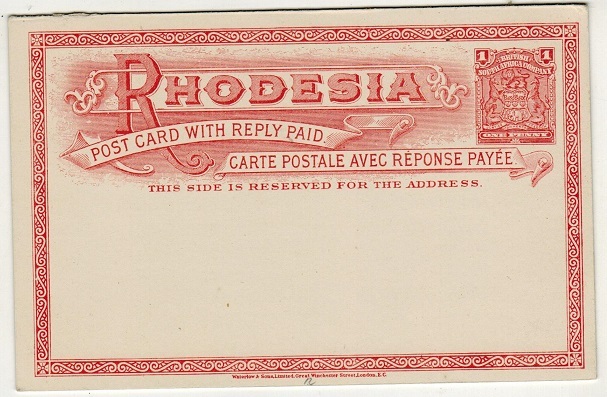 RHODESIA - 1903 1d carmine postal stationery letter card used locally. H&G 1. 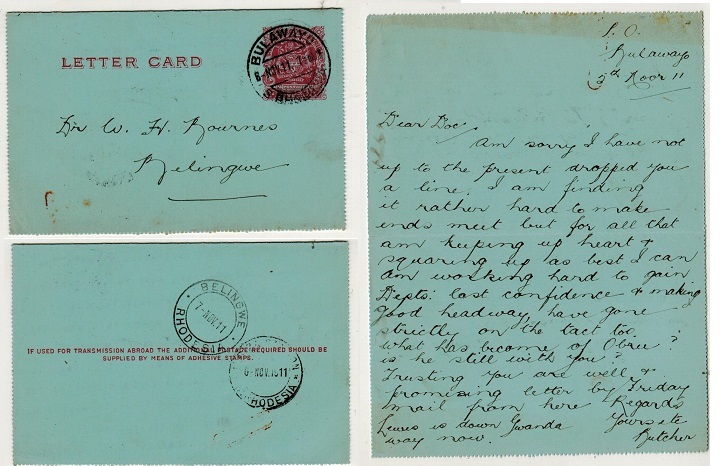 1903 1d carmine on pale blue postal stationery letter card adressed locally to Belingwe (genuine message) cancelled by BULAWAYO/S.RHODESIA cds dated 6.NOV.11 and with BELINGWE/RHODESIA arrival b/s. H&G 1. RHODESIA - 1910 2 1/2d rate cover to Ireland used at CHINSALI/N.E.RHODESIA. 1910 (SEP.21.) 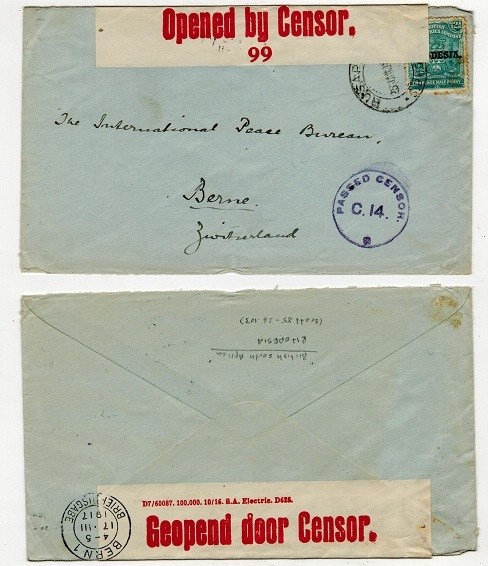 cover addressed to Ireland bearinng 2 1/2d 'arms' adhesive tied by CHINSALI/N.E.RHODESIA cds. Scarce strike. RHODESIA - 1899 1d brick red illustrated PSC to France used at ABERCORN/N.E.RHODESIA. SG 11a. 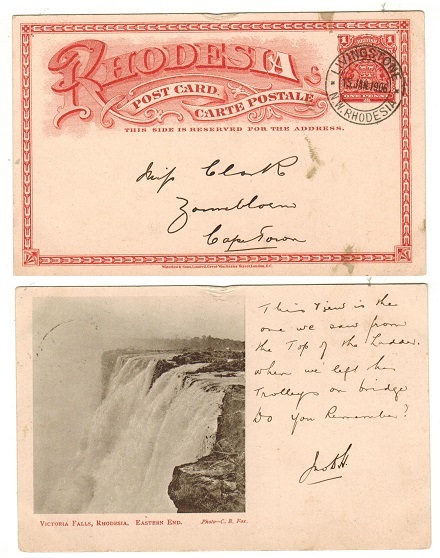 1899 1d brick red on cream illustrated postal stationery postcard addressed to France (tears at bottom edge repaired) depicting 'Victoria Falls, View from North Bank' and cancelled by d/r ABERCORN/N.E.RHODESIA cds dated 14.OCT.15. A late use of this stationery card. H&G 11a. RHODESIA - 1901 2d rate 'Boer War' censored cover used at UMTALI. 1901 (JUL.25.) 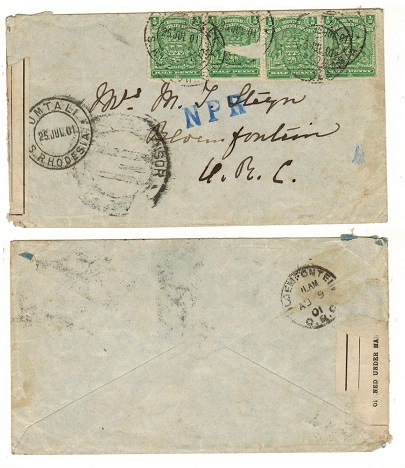 cover addressed to Bloemfontein bearing 1/2d green 'arms' adhesive (x4-one with surface fault) cancelled by d/r UMTALI/S.RHODESIA cds's and with part black on white OPENED UNDER MARTIAL LAW censor label at left and struck on the front by blotched PASSED BY CENSOR d/r handstamp with 'NPR' strike in blue alongside. A Boer War use. RHODESIA - 1905 5/- violet 'falls' adhesive in very fine mint condition. SG 99. 1905 5/- violet 'falls' adhesive in very fine mint condition. SG 99. 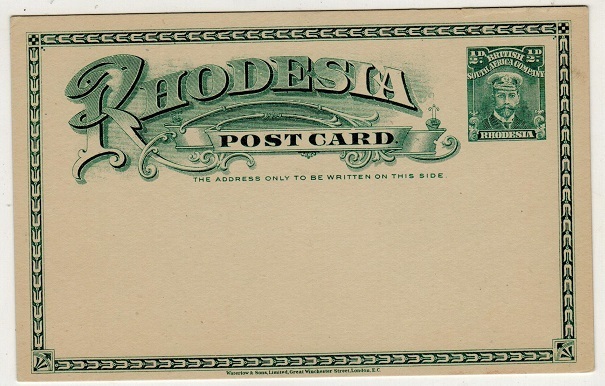 RHODESIA - 1903 1/2d green PSC unused. H&G 13. 1903 1/2d blue green on cream postal stationery postcard in fine unused condition. H&G 13. RHODESIA - 1899 1d brick red illustrated PSC to UK used at BULAWAYO. H&G 11a. 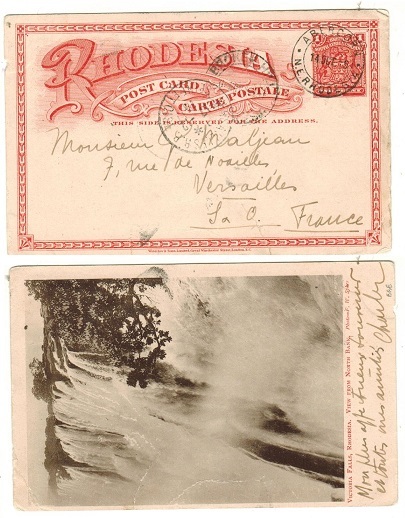 1899 1d brick red on cream postal stationery postcard addressed to UK with official picture view on reverse side depicting 'Victoria Falls-The Zambesi above the falls' (small motor launch) cancelled by BULAWAYO/RHODESIA cds dated 10.JUN.05. 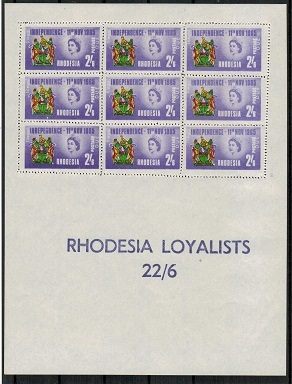 Most of these view cards were used in Northern Rhodesia this example being used close to the earliest known date of May 18th 05. H&G 11a. 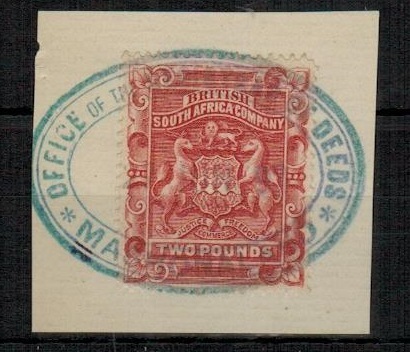 RHODESIA - 1899 1d brick red illustrated PSC to Cape Town used at LIVINGSTONE. H&G 11a. 1899 1d brick red on cream illustrated postal stationery postcard addressed to Capetown depicting Victoria Falls-Eastern End' and cancelled by LIVINGSTONE/N.W.RHODESIA cds dated 15.JAN.06. H&G 11a. RHODESIA - 1899 1d brick red illustrated PSC to UK used at VICTORIA FALLS. H&G 11a. 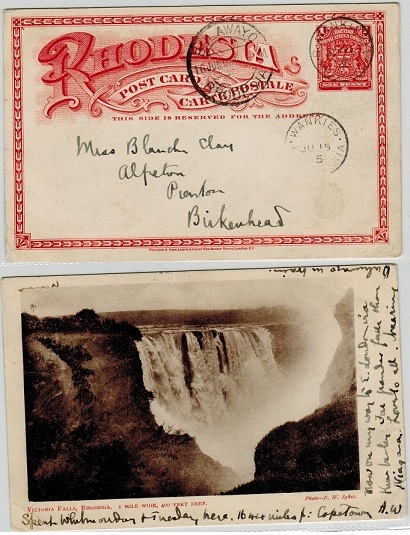 1899 1d brick red on cream postal stationery postcard addressed to UK with scarce view on reverse side depicting 'Victoria Falls, Rhodesia. Eastern End' cancelled by VICTORIA FALLS/S.RHODESIA cds dated 24.MAR.1909. H&G 11a. RHODESIA - 1899 1d brick red illustrated PSC to UK used at WANKIES. H&G 11a. 1899 1d brick red on cream postal stationery postcard addressed to UK cancelled by small s/r WANKIES/S.RHODESIA cds dated JU.15.05 with BULAWAYO transit at left. 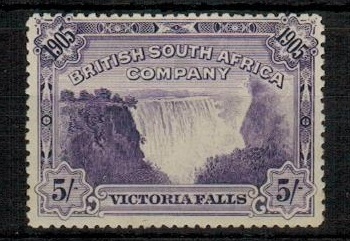 The reverse side depicts 'Victoria Falls, Rhodesia - 1 mile wide, 400 feet deep in sepia. H&G 11a. RHODESIA - 1899 1d brick red illustrated PSC to UK used at KASEMPA. H&G 11a. 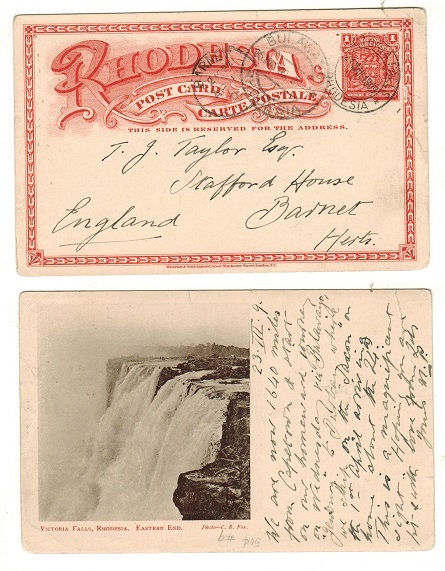 1899 1d brick red on cream postal stationery postcard with illustration on reverse depicting 'Victoria Falls, Eastern End' addressed to UK. (Small piece missing from middle of top edge.) The card is cancelled by rare KASEMPA/N.W.RHODESIA cds dated 11.MAR.1907 (Proud type D3) with TRURO arrival cds alongside. A rare use of this 'view' stationery card at Kasempa. H&G 11a. 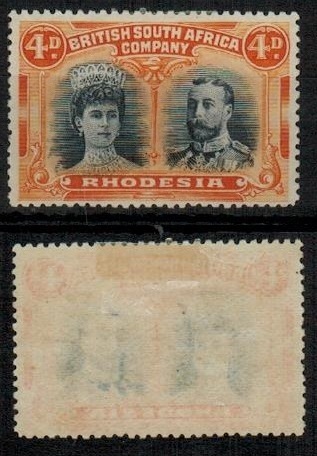 RHODESIA - 1892 5/- orange yellow revenue use on piece at LOMAGONDI. SG 8. 1892 5/- orange yellow (SG 8) tied to piece by superb MINING COMMISSIONER/LOMAGONDI rubber handstamp in red ink. 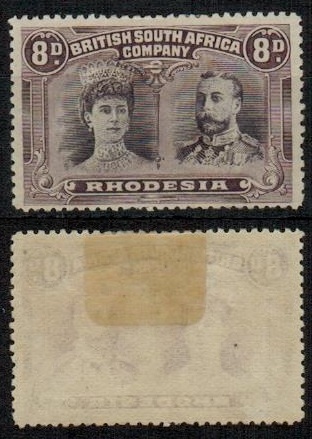 RHODESIA - 1892 1/- grey brown revenue use on piece at MANICA. SG 4. 1892 1/- grey-brown adhesive (SG 4) tied to piece by oval MINING COMMISSIONER/MANICA handstamp in blue-black. 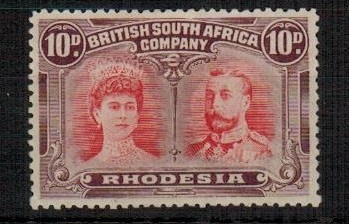 RHODESIA - 1910-13 10d scarlet and reddish mauve 'double head' fine mint. SG 149. 1910-13 10d scarlet and reddish mauve 'double head' in fine mint condition. SG 149. 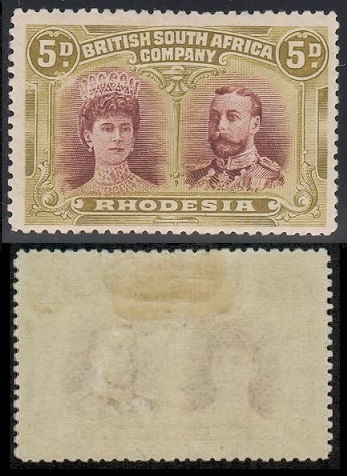 RHODESIA - 1893 revenue use of 1/- and 2/- (SG 4+5) at MASHONALAND. 1893 (OCT.30.) use of 1/- grey-brown and 2/- vermilion (SG 4+5) on small piece cancelled by superb oval MAGISTRATES COURT/MASHONALAND handstamp in red ink. 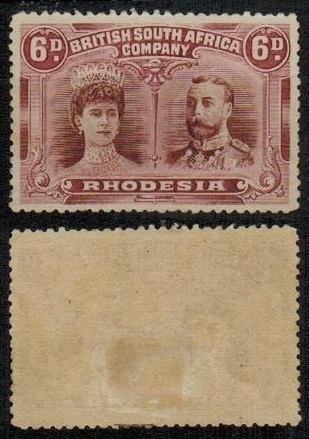 RHODESIA - 1895 revenue use of £2 rose-red (SG 11) at MASHONALAND. 1895 (JN.1.) use of £2 rose-red (SG 11) tied to small piece by superb oval OFFICE OF THE REGISTRAR OF DEEDS/MASHONALAND handstamp in blue-green ink. RHODESIA - 1910-13 1/2d blue green (Perf 15) 'double head' in used condition. SG 167. 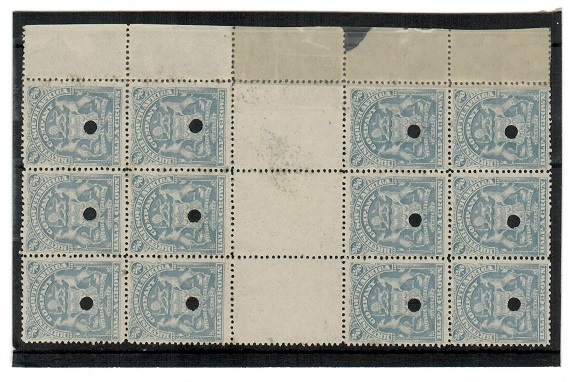 1910-13 1/2d blue green (Perf 15) 'double head' in used condition. SG 167. 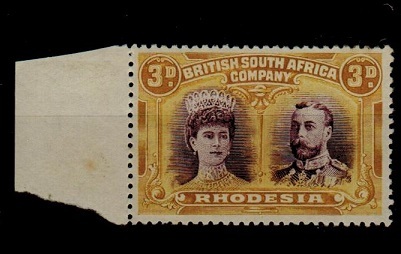 RHODESIA - 1910 5d purple brown and olive yellow fine used. SG 141a. 1910-13 5d purple brown and olive yellow 'double head' in fine used condition. SG 141a. 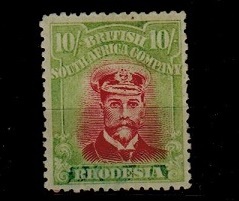 RHODESIA - 1904 1/2d green PSE used locally at VICTORIA. H&G 1. 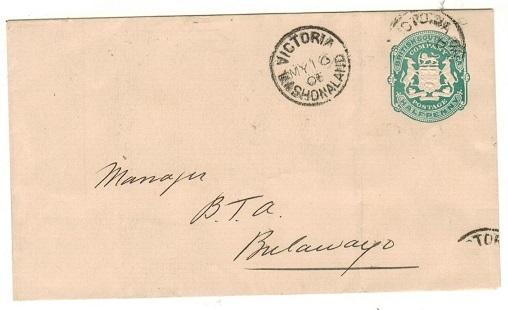 1904 1/2d green on cream postal stationery envelope with tongued flap (size a) addressed locally to Bulawayo (vertical fold) cancelled by VICTORIA/MASHONALAND cds dated MY.16.06. H&G 1. 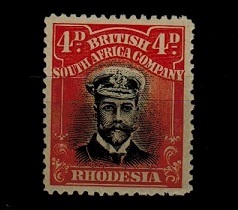 RHODESIA - 1893 1d red brown 'Mashonaland' PSC unused. H&G 2. 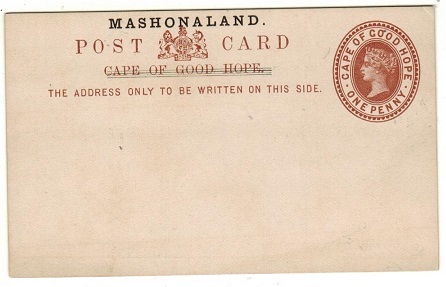 1893 1d red-brown on cream postal stationery postcard of Cape Of Good Hope overprinted MASHONALAND in black in fine unused condition. H&G 2. 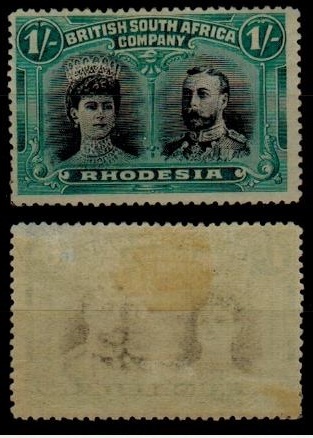 RHODESIA - 1904 1/2d green PSE unused. H&G 1. 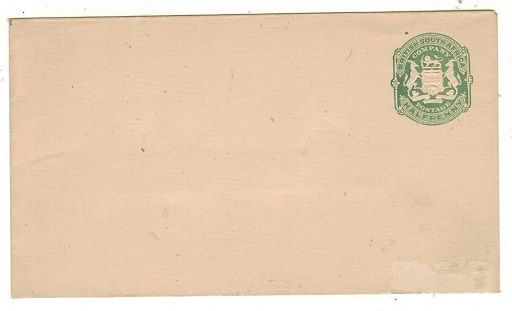 1904 1/2d green on cream postal stationery envelope (size a) with open end at right in unused condition. Small surface rub at lower right corner. H&G 1. RHODESIA - 1913 4d black and orange red 'Admiral' fine mint. SG 261. 1913-22 4d black and orange red 'admiral' issue of the perf 14 Die 3 issue in fine mint condition. SG 261. RHODESIA - 1913 1/2d green PSC fine unused. H&G 14. 1913 1/2d green on cream 'Admiral' postal stationery postcard (no imprint) in fine unused condition. H&G 14. 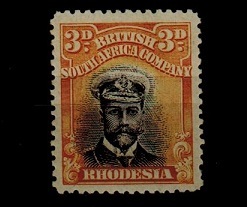 RHODESIA - 1913 3d black and yellow 'Admiral' fine used. SG 210. 1913 3d black and yellow fine used from the perf 14 Die I issue with part QUEQUE cds dated 1916. SG 210. 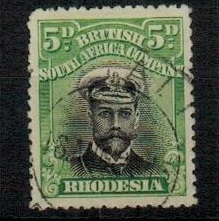 RHODESIA - 1913 5d black and green 'Admiral' fine used. SG 212. 1913-22 5d black and green 'admiral' perf 14 Die I issue in fine used condition. SG 212. RHODESIA - 1917 1d rate postcard use to UK used at BULAWAYO STATION. 1917 (NOV.24.) 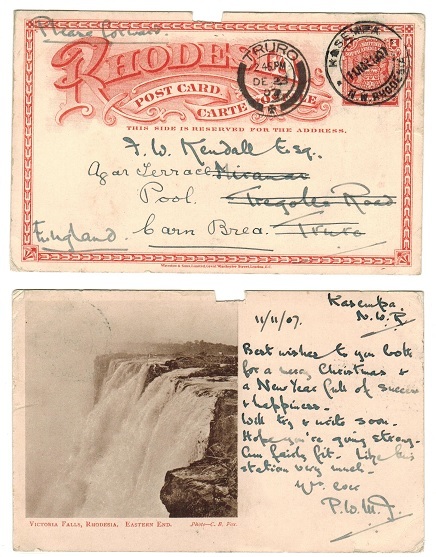 use of picture postcard addressed to UK depicting 'Victoria Falls' bearing 1d adhesive tied by d/r BULAWAYO STATION/S.RHODESIA cds. RHODESIA - 1919 1 1/2d brown ochre fine mint showing IMPERFORATE TO LEFT GUTTER. SG 197. 1919 1 1/2d brown-ochre 'admiral' single working plate issue with perf 14 in a mint IMPERFORATE TO LEFT GUTTER example. Unmounted mint but with overall light toned gum. A scarce variety on this 1 1/2d value. SG 197. RHODESIA - 1923 10d bright ultramarine and carmine-red 'Admiral' fine mint. SG 316. 1923 10d bright ultramarine and carmine-red 'Admiral' adhesive in a fine mint condition of the Die 3 perf 15 issue. SG 316. 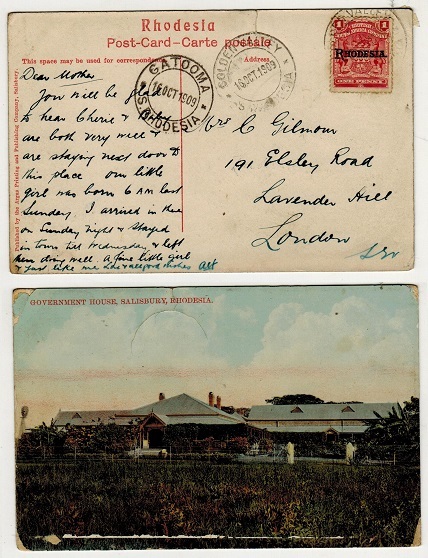 RHODESIA - 1911 1/2d 'double head' postcard local use to 'Fig Tree Siding' used at SALISBURY. 1911 (DEC.21.) local postcard use bearing 1/2d green 'Double Head' adhesive tied by SALISBURY/ S.RHODESIA cds. RHODESIA - 1919 2 1/2d censored cover to USA used at MELSETTER. 1919 (JU.7.) 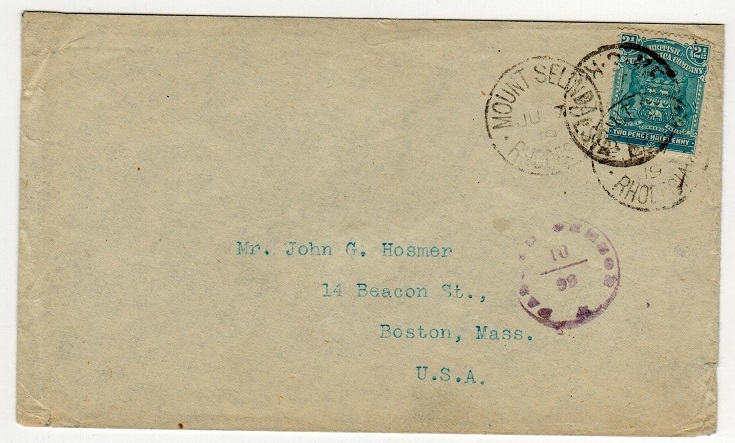 cover addressed to USA bearing 2 1/2d adhesive tied by light MELSETTER cds with MOUNT SELINDA cds's alongside and struck by violet circular PASSED CENSOR/ 10/99 censor h/s. 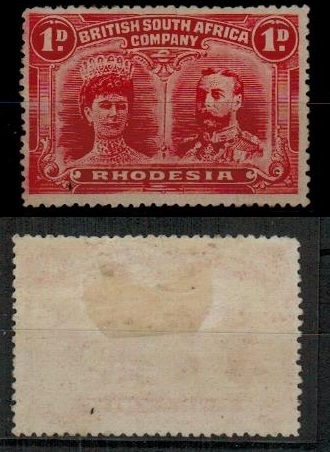 1910-13 1d rose-red 'double head' adhesive (perf 14) in mint condition showing the 'OD' flaw in Rhodesia. SG 125. RHODESIA - 1917 'OAS' stampless cover to Cape Town used at LIVINGSTONE. 1917 (20.JAN.) 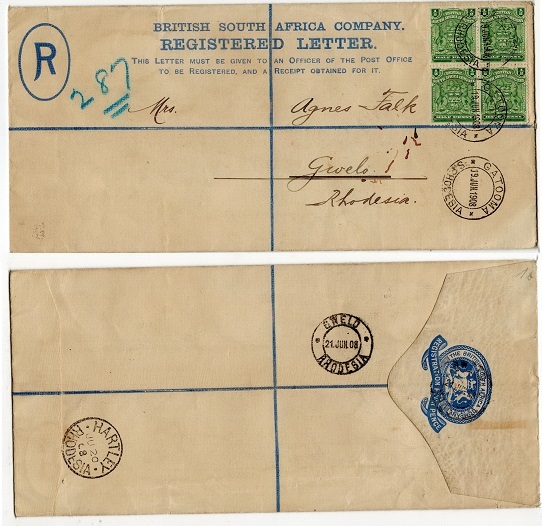 stampless cover addressed to Cape Town marked 'On Service' and sent from the British South Africa Company cancelled by LIVINGSTONE/N.W.RHODESIA cds and signed at lower left with violet B.S.A. Co. COMMERCIAL BRANCH h/s above. The cover went uncensored presumably due to its origin. RHODESIA - 1917 2 1/2d rate censored cover to Switzerland used at RUSAPE. 1917 (JAN.25.) cover addressed to Switzerland bearing 2 1/2d adhesive overprinted RHODESIA tied by RUSAPE/S.RHODESIA cds with red on cream D7/60087.100,000. 10/16. S.A. ELECTRIC D.625 bilingual OPENED BY CENSOR/99 censor label in transit via South Africa and struck by violet PASSED CENSOR/C.14. h/s. RHODESIA - 1916 1/2d green PSE unused. H&G 4. 1916 1/2d green on cream postal stationery envelope (size c) with tuck in type flap in unused condition. No embossing under flap. The front has a very small edge stain and there is a further stain on reverse side. 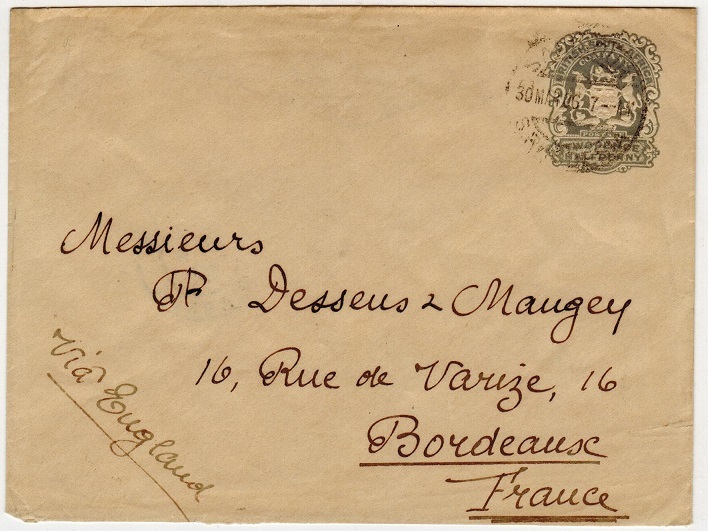 This envelope is exceedingly rare especially in this size and very few examples have been recorded. H&G 4a. RHODESIA - 1922-23 10/- pale crimson and pale yellow green (colour variation) U/M. SG 309. 1922-23 10/- pale crimson and pale yellow green (colour variation) 'admiral' adhesive of the perf 14 Die 3 issue in unmounted mint condition. SG 309. 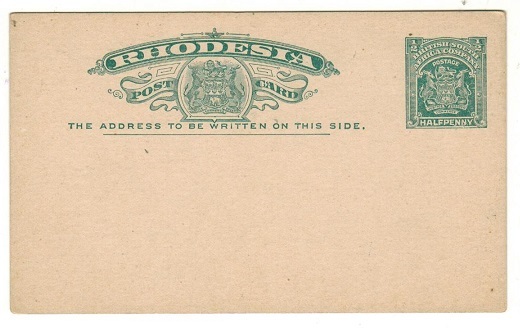 RHODESIA - 1918 stampless 'On Postal Service' censored envelope to USA used at MOUNT SELINDA. 1918 (JY.20.) stampless 'ON POSTAL SERVICE' cover addressed to USA cancelled by MOUNT SELINDA/RHODESIA cds and struck by circular PASSED BY CENSOR/ 10/99 strike in black. RHODESIA - 1913 1/2d blue-green on cream PSC unused. H&G 14a. 1913 1/2d blue-green on cream postal stationery postcard in fine unused condition with 'Waterlow & Sons Limited' imprint at bottom edge. H&G 14a. 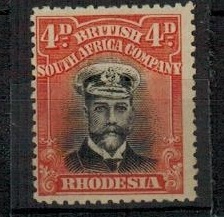 RHODESIA - 1913 1d red on cream 'Admiral' PSE unused. H&G 5. 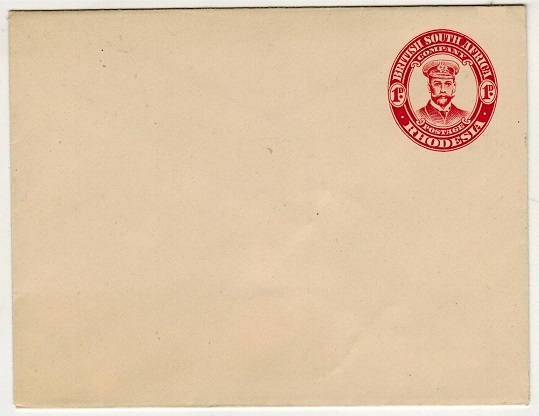 1913 1d red on cream 'Admiral' postal stationery envelope (size d) in fine unused condition. H&G 5. RHODESIA - 1899 1d+1d Brick red on white PSRC unused. H&G 12. 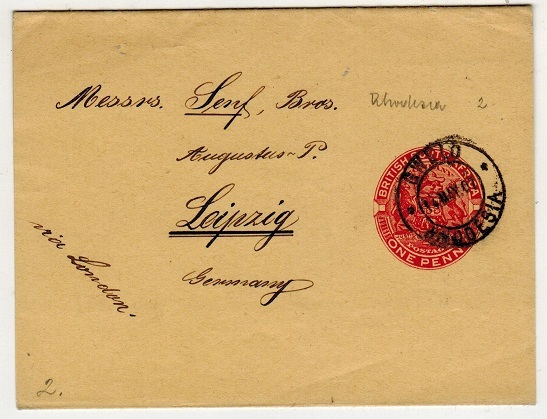 1899 1d+1d Brick red on white postal stationery reply type postcard. Fine unused. H&G 12. RHODESIA - 1897 1d+1d Red on white PSRC unused. H&G 10. 1897 1d+1d Red on white postal stationery postcard. Fine unused. H&G 10. 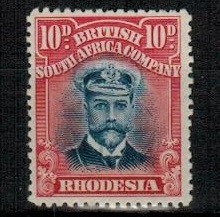 RHODESIA - 1897 1d blue on white PSC unused. H&G 8. 1897 1d blue on white postal stationery postcard in fine unused condition. H&G 8. RHODESIA - 1893 1d + 1d Brown red on white 'Mashonaland' PSRC unused. H&G 7. 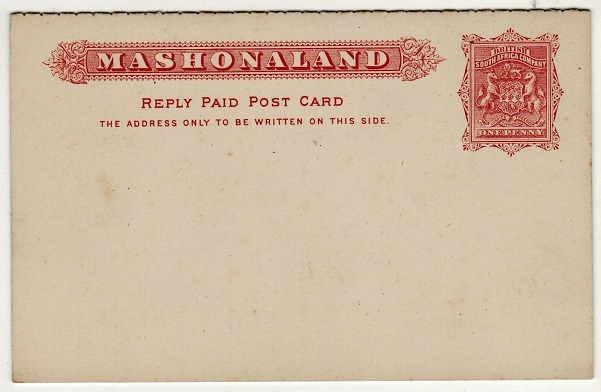 1893 1d + 1d Brown red on white 'Mashonaland' postal stationery reply type postcard in fine unused condition. Some light tone marks. H&G 7. RHODESIA - 1916 1d rate postcard use to UK used at BINDURA. 1916 (JUN.12.) use of postcard addressed to UK depicting real photograph of 'Botanical Gardens at Durban' bearing 1d 'admiral' tied by light BINDURA/S.RHODESIA cds with a stronger strike at left. 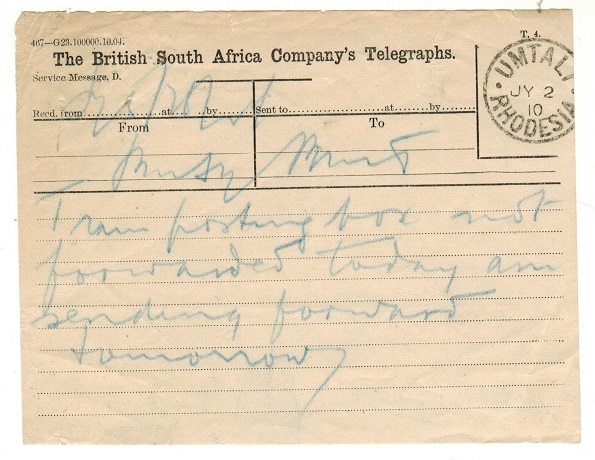 RHODESIA - 1910 TELEGRAM form used at UMTALI. 1910 (JY.2.) 'The British South Africa Company's Telegraphs' form cancelled UMTALI/RHODESIA. RHODESIA - 1911 TELEGRAM form used at SALISBURY. 1911 (NOV.19.) 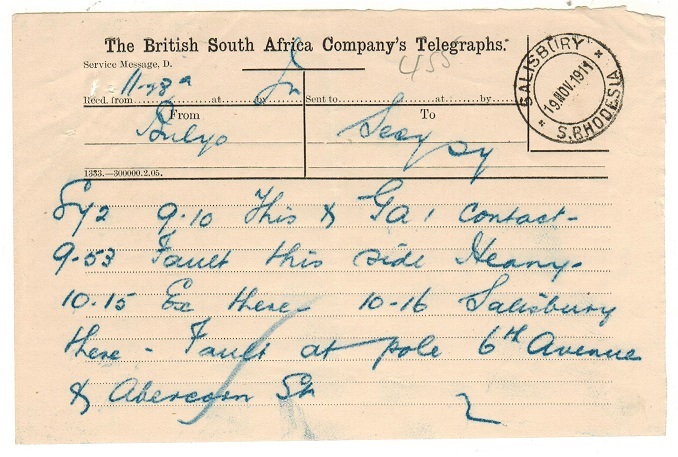 'The British South Africa Company's Telegraphs' form from Bulawayo cancelled on dispatch SALISBURY/S.RHODESIA. RHODESIA - 1907 1d rate postcard use to UK used at KOPJE SALISBURY. 1907 (SP.6.) 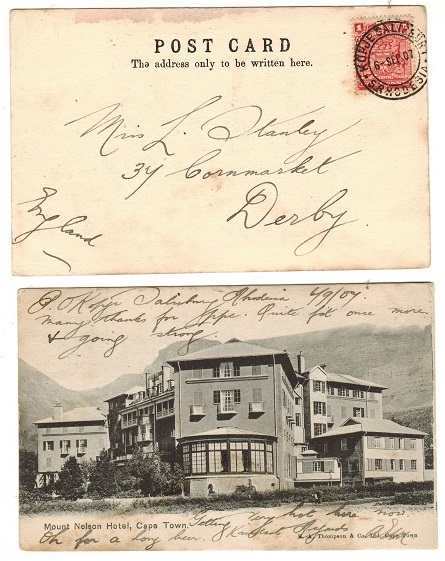 use of postcard addressed to UK depicting 'Mount Nelson Hotel-Cape Town' bearing 1d 'arms' adhesive tied KOPJE SALISBURY. RHODESIA - 1892 5/- IMPERFORATE PLATE PROOF in orange-yellow on ungummed card. 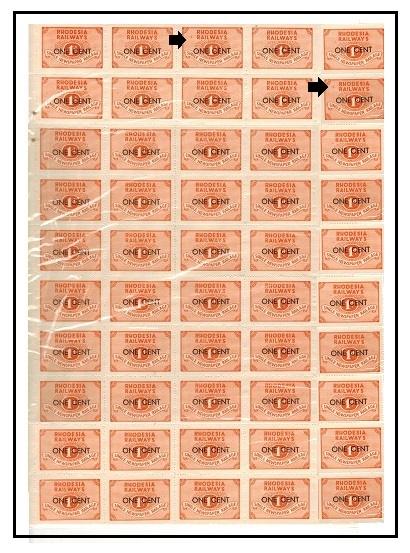 1892 5/- IMPERFORATE PLATE PROOF (SG type 1) printed in the issued colour of orange-yellow on thin ungummed card. RHODESIA - 1913 1d rate 'double head' postcard use to UK used at PAULINGTON. 1913 (MAY.16.) 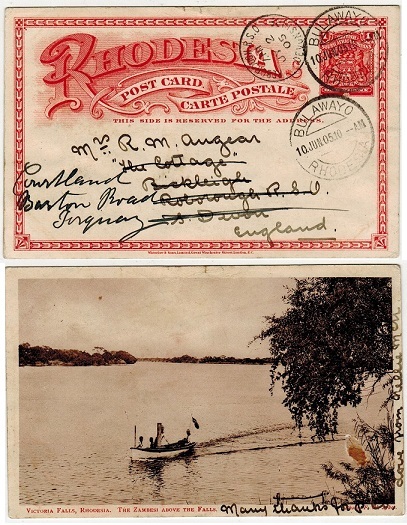 use of picture postcard addressed to UK bearing 1d 'double head' adhesive tied by light PAULINGTON/S.RHODESIA cds. RHODESIA - 1909 1d rate postcard use to UK used at OLD UMTALI. 1909 (AUG.1.) use of picture postcard addressed to UK depicting 'Drill Hall-Salisbury' and bearing 1d 'arms' adhesive tied by scarce OLD UMTALI/S.RHODESIA d/r cds with s/r UMTALI transit cds at left struck the following day. 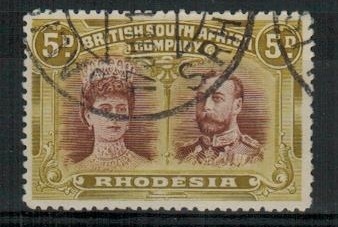 RHODESIA - 1896 1/- yellow ochre very fine mint. SG 64. 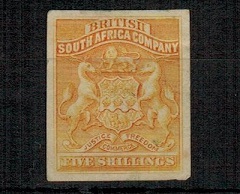 1896 1/- yellow ochre of Cape Of Good Hope overprinted BRITISH/SOUTH AFRICA/COMPANY in a very fine fresh mint left hand marginal example. SG 64. RHODESIA - 1968 5/- black on yellow 'Ministry Of Posts' BOOKLET. SG SB8. 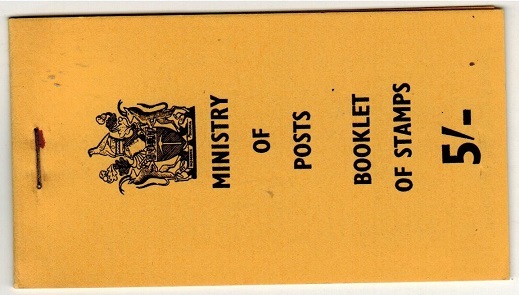 1968 5/- black on yellow 'Ministry Of Posts' BOOKLET. SG SB8. RHODESIA - 1966 1/2d 'maize' U/M block of six with spectacular OFFSET on reverse. SG 359. 1966 1/2d 'Maize' adhesive of Southern Rhodesia overprinted INDEPENDENCE in a fine unmounted mint block of six showing a stunning OFFSET on reverse side. Only one sheet was discovered. SG 359. RHODESIA - 1966 faked 2/6d 'Independence' cover to UK. 1966 (11.NOV.) 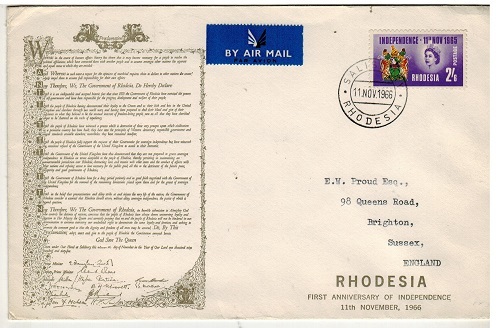 'First Independence' anniversary cover addressed to UK bearing the 2/6d (SG 358) tied SALISBURY/RHODESIA. 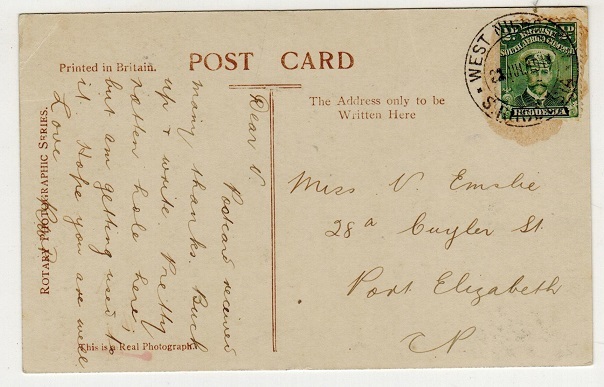 Addressed to Edward Proud (stamp dealer). RHODESIA - 1909 1d rate postcard to UK used at GOLDEN VALLEY. 1909 (OCT.16.) use of picture postcard addressed to UK depicting 'Government House, Salisbury' bearing 1d 'Rhodesia' overprinted arms adhesive tied by GOLDEN VALLEY/S.RHODESIA cds with GATOOMA transit cds alongside. 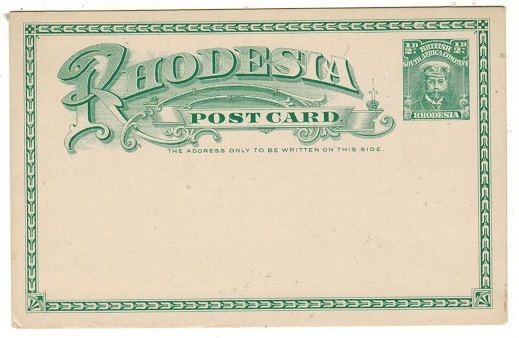 RHODESIA - 1909 use of postcard to UK used at ELDORADA MINE. 1909 (JUL.22.) 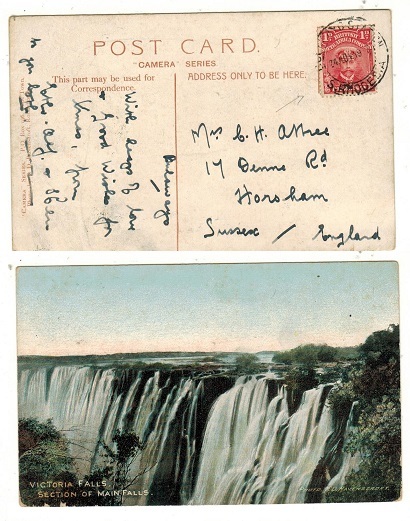 use of picture postcard addressed to UK depicting 'Victoria Falls' bearing 1d 'arms' adhesive (corner fault) tied by ELDORADO MINE/S.RHODESIA cds. RHODESIA - 1893 4d ultramarine RPSE (size H2) to Gwelo used at GATOOMA. H&G 1a. 1893 4d ultramarine on cream registered postal stationery envelope (size H2) addressed locally to Gwelo bearing additional 1/2d green 'arms' block of four tied by GATOOMA/S.RHODESIA cds dated 19.JUN.1908. H&G 1a. RHODESIA - 1911 1/2d rate postcard use to Port Elizabeth used at WEST NICHOLSON. 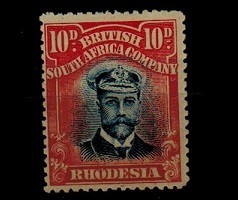 1911 (JUL.22) use of 'GB' picture postcard addressed to the Cape & bearing 1/2d 'admiral' adhesive cancelled by d/r WEST NICHOLSON/S.RHODESIA cds. RHODESIA - 1904 2 1/2d grey PSE to France used at SALISBURY. H&G 3a. 1904 2 1/2d grey on thin yellowish parchment paper postal stationery envelope (size f) addressed to France cancelled SALISBURY and dated 30.MAR.06. H&G 3a. 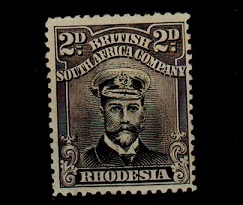 RHODESIA - 1913 2d black and grey 'admiral' mint. SG 219. 1913-22 2d black and grey 'admiral' issue of the perf 14 Die 2 issue in fine mint condition. SG 219. RHODESIA - 1918 'PASSED CENSOR' cover to USA used at MOUNT SELINDA. 1918 (MY.4.) cover addressed to USA (central bend) bearing 2 1/2d adhesive tied by MOUNT SELINDA/RHODESIA cds and struck by blue circular PASSED CENSOR/ 10/99 handstamp. 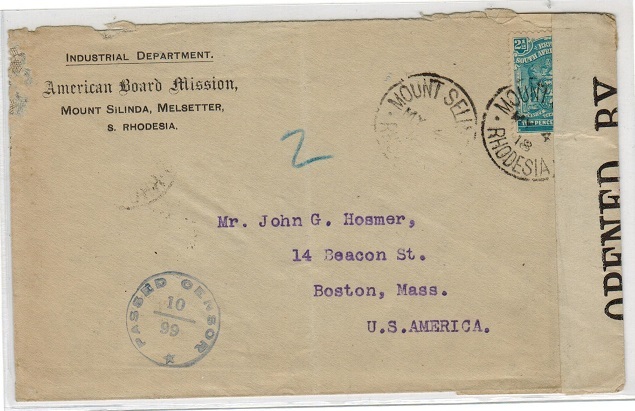 Sent from the 'American Board Mission' at Mount Selinda and with black on white OPENED BY/ CENSOR/1915 on arrival. 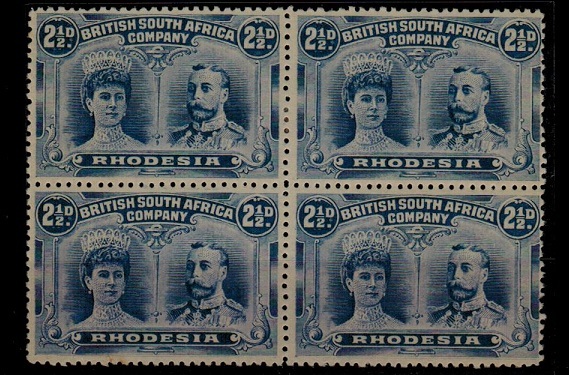 RHODESIA - 1905 2 1/2d deep blue 'falls' adhesive fine mint. SG 95. 1905 2 1/2d deep blue 'falls' adhesive in fine mint condition of the perf 14 issue. SG 95. RHODESIA - 1913 10d blue and red 'admiral' fine mint. SG 247. 1913-22 10d blue and red 'admiral' issue of the perf 15 Die 2 issue in fine mint condition. SG 247. 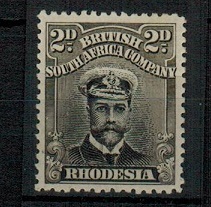 RHODESIA - 1913 2d black and grey 'admiral' fine mint. SG 256. 1913-22 2d black and grey black Die III 'admiral' adhesive in fine mint condition. SG 256. RHODESIA - 1913 4d black and orange red 'admiral' fine mint. SG 225. 1913-22 4d black and deep orange red 'admiral' issue of the perf 14 Die 2 issue in fine mint condition. SG 225. 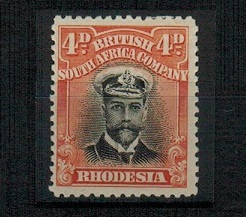 RHODESIA - 1913 3d black and buff 'admiral' fine mint. SG 223. 1913-22 3d black and buff 'admiral' issue of the perf 14 Die 2 issue in fine mint condition. SG 223. 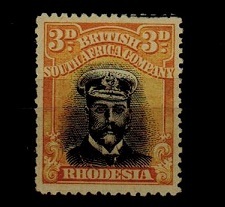 RHODESIA - 1913 3d black and deep yellow 'admiral' fine mint. SG 221. 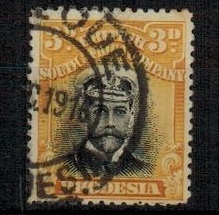 1913-22 3d black and deep yellow 'admiral' issue of the perf 14 Die 2 issue in fine mint condition. SG 221. RHODESIA - 1913 4d black and orange-red 'admiral' fine mint. SG 211. 1913-22 4d black and orange-red 'admiral' issue of the perf 14 Die 1 issue in fine mint condition. SG 211. RHODESIA - 1906 2/6d bluish grey GUTTER marginal block of 12 with official security punch holes. 1906 2/6d bluish grey unused GUTTER MARGINAL block of 12 (side margin re-inforced) with each stamp having 'official punch hole' from file archive. Stamps 48/50,58/60 and 8/9, 18/20. SG 85. 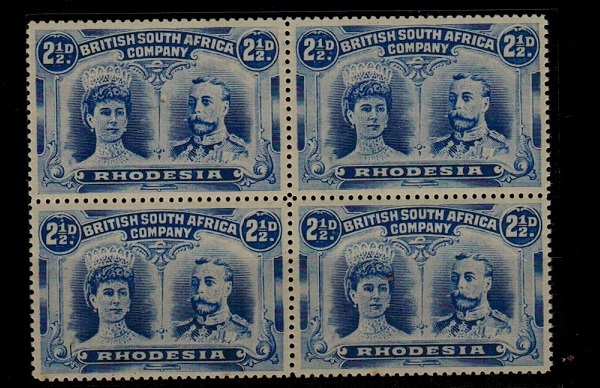 RHODESIA - 1910 2 1/2d bright ultramarine 'double head' block of four used at SALISBURY. SG 131a. 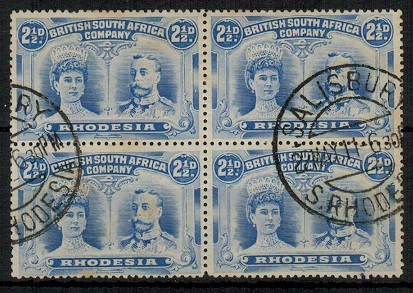 1910-13 2 1/2d bright ultramarine (perf 14) in a fine block of four cancelled by SALISBURY/ S.RHODESIA cds dated 22.MY.11. SG 131a. RHODESIA - 1910 3d 'double head' unmounted mint. SG 134. 1910-13 3d Purple and ochre 'Double Head' adhesive in a superb unmounted mint left hand marginal example. SG 134. RHODESIA - 1910 2 1/2d 'double head' mint block of four of the perf 13 1/2 issue. SG 184. 1910-13 2 1/2d ultramarine 'double head' adhesive (perf 13 1/2) in a very fine mint block of four. A scarce multiple. SG 184. RHODESIA - 1910 2 1/2d 'double head' U/M block of four of the perf 15 issue. SG 172. 1910-13 2 1/2d ultramarine 'double head' adhesive (perf 15) in a very fine unmounted mint block of four. A scarce multiple. SG 172. 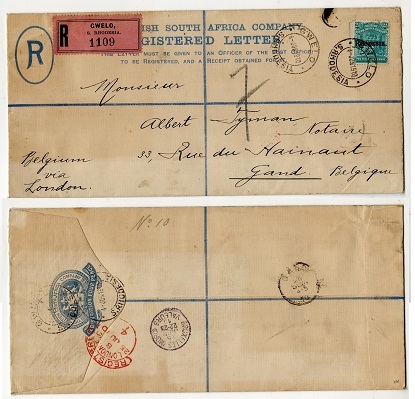 RHODESIA - 1893 4d ultramarine RPSE to Belgium uprated at GWELO. H&G 1a. 1893-1924 4d ultramarine on cream registered postal stationery envelope (size H2) addressed to Belgium & bearing additional 2 1/2d adhesive (SG 103) tied by d/r GWELO/S.RHODESIA cds dated 4.JUN.1910 with black on salmon R/GWELO/S.RHODESIA registered label at left. Scarce. H&G 1a. 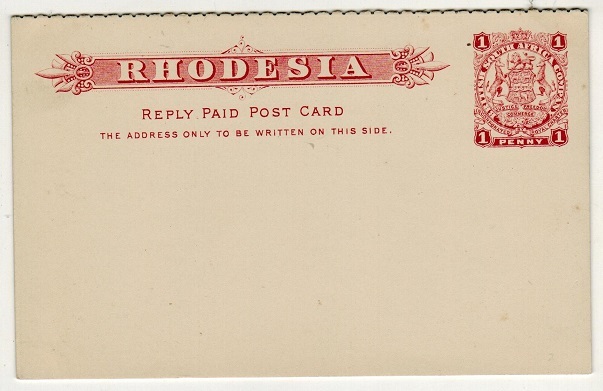 RHODESIA - 1904 1d red postal stationery wrapper to Germany used at GWELO. H&G 2. 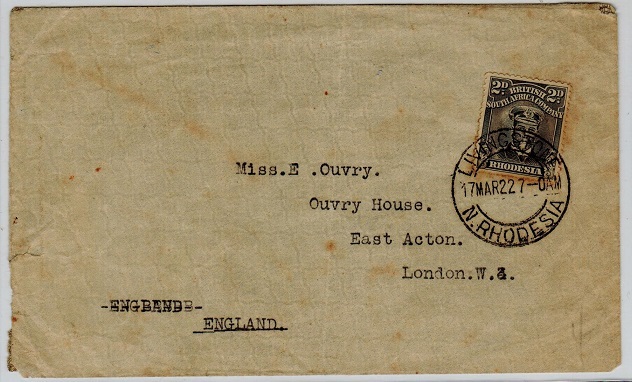 1904 1d red on buff postal stationery wrapper addressed to Germany cancelled by GWELO/ S.RHODESIA cds dated 14.MAY.07. H&G 2. 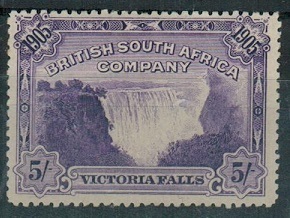 RHODESIA - 1905 5/- violet 'Victoria Falls' adhesive fine mint. SG 99. 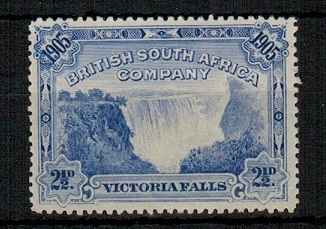 1905 5/- violet 'Victoria Falls' adhesive in fine fresh mint condition. A very difficult stamp to find in nice condition. SG 99. RHODESIA - 1922 2d 'admiral' rate cover to UK (faults) used at LIVINGSTONE/N.RHODESIA. 1922 (MAR.17.) 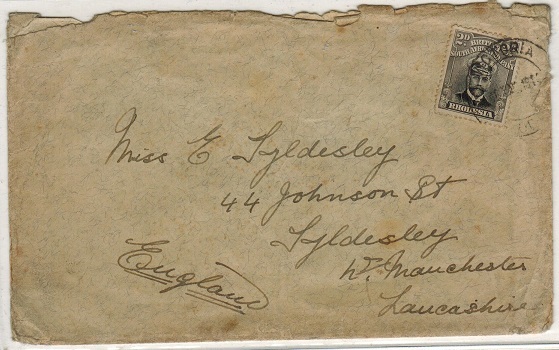 cover addressed to UK (part of reverse left edge torn away from careless opening and somewhat aged - faults) bearing 2d 'admiral' adhesive from Die 3 cancelled by LIVINGSTONE/N.RHODESIA cds. 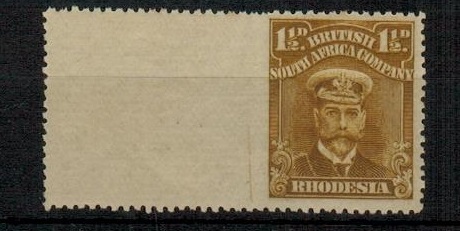 RHODESIA - 1913 2d rate 'admiral' cover to UK used at VICTORIA. 1913 (MY.16.) cover addressed to UK (somewhat tired with edge faults) bearing 2d 'admiral' DIE 1 issue cancelled by VICTORIA/S.RHODESIA cds. 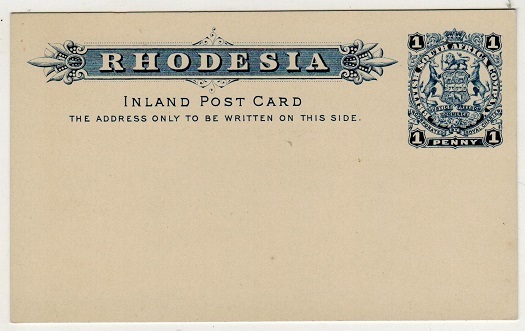 RHODESIA - 1913 use of postcard to UK struck by large part of the scarce T.P.O./S.RHODESIA cds. 1913 (8.JUL.) use of picture postcard addressed to UK depicting 'Scenery In The Matopos' and bearing 1d 'Admiral' tied to the picture side by large part of the scarce T.P.O./S.RHODESIA cds. 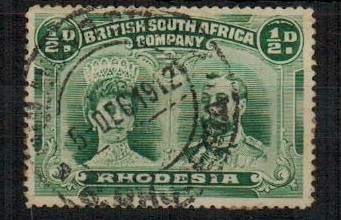 RHODESIA - 1903 1/2d green PSC sent locally to Cathcart used at FIGTREE. H&G 13. 1903 1/2d blue green on white postal stationery postcard to Cape Colony cancelled by d/r FIGTREE/S.RHODESIA cds dated 20.JUN.1918. H&G 13.